Make your own reindeer games with this easy DIY treat! 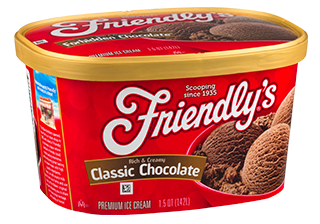 Add one scoop of Friendly’s Classic Chocolate ice cream to the ice cream cone. Place two chocolate chips on the ice cream for eyes. Place the red gumdrop nose beneath the chocolate chips. Break one pretzel in half and place on either side to create antlers. Who doesn’t love chocolate ice cream? Treat yourself to scoop after scoop of our super creamy, deliciously rich premium Classic Chocolate ice cream.